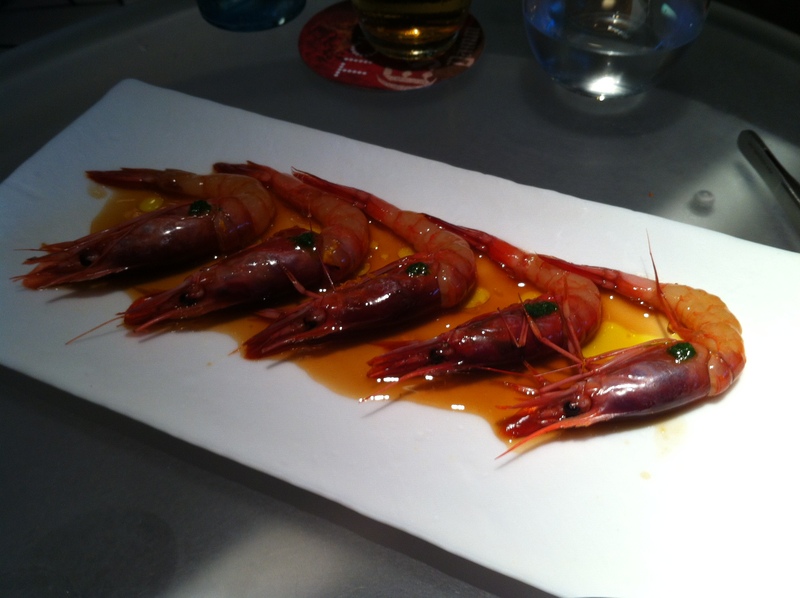 Tickets, Barcelona | 15,000kms of Food! People, believe the hype. Tickets is all that they say it is, which is totally amazing. We booked 3 months in advance on the web before heading off (note to east coast Australians – the clock resets at 8am our time for the bookings). The restaurant’s decor is whimsical, inviting and open. The service was brilliant. And the food was magnificent. When in Spain, must eat jamon. 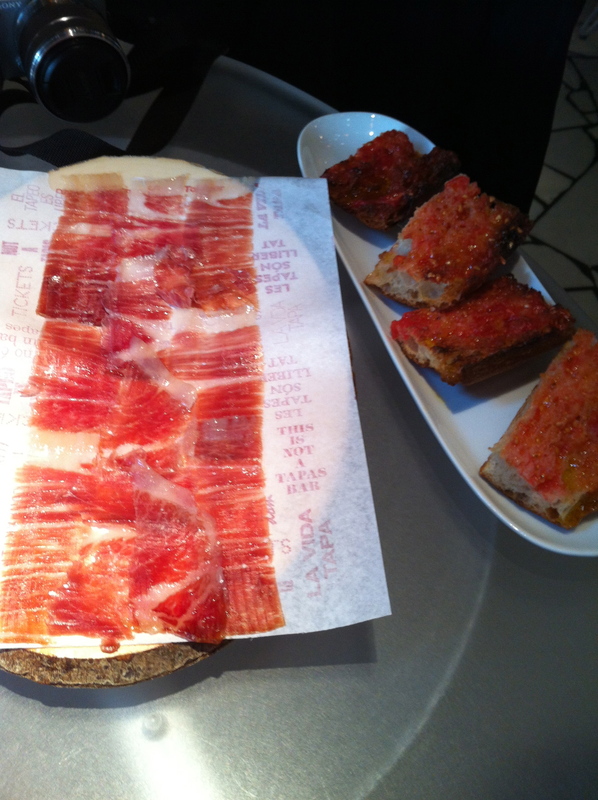 We had the thinly sliced salty “Joselito’s Gran Reserva iberian ham” with “the tomato bread” which was toasted and smeared with rich tomato goodness. 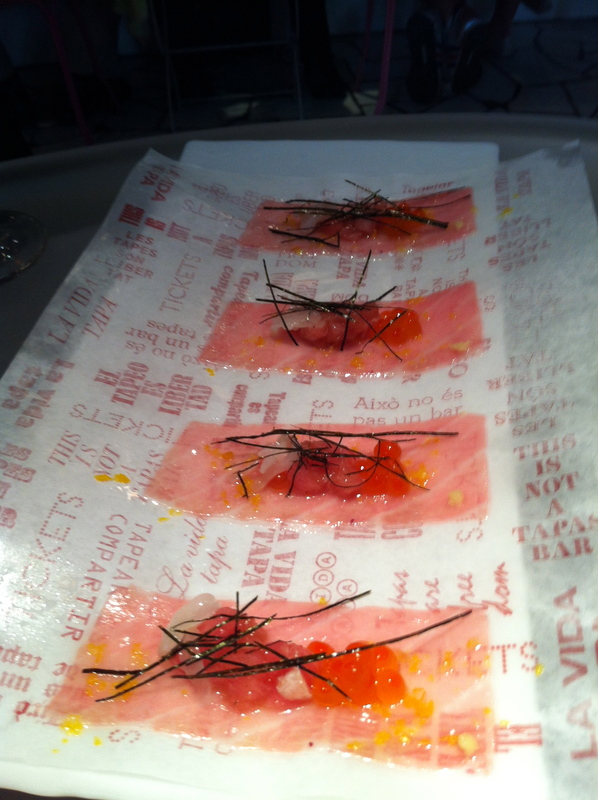 The “slices of tuna belly with it’s tartare, panceta and salmon roe” was delicate yet packed a punch. 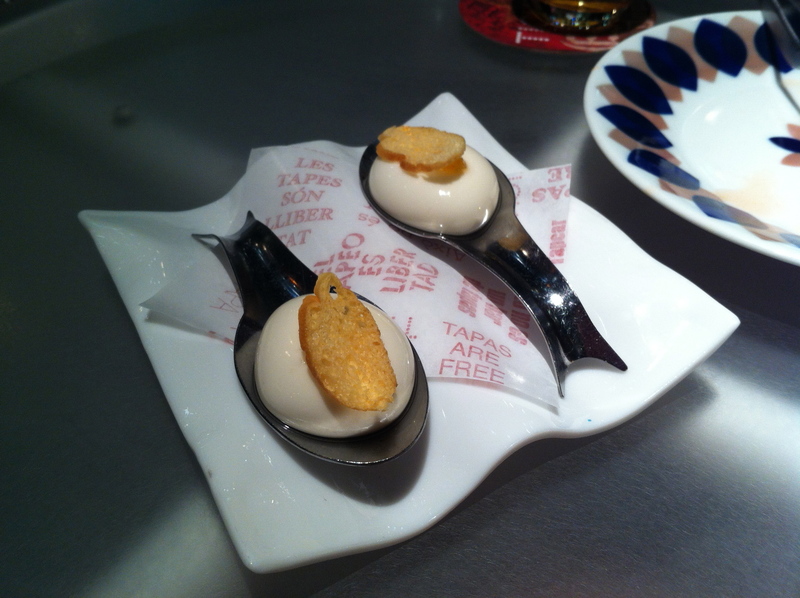 These “miniairbags stuffed with manchego cheese” were like eating puffy clouds of cheese. 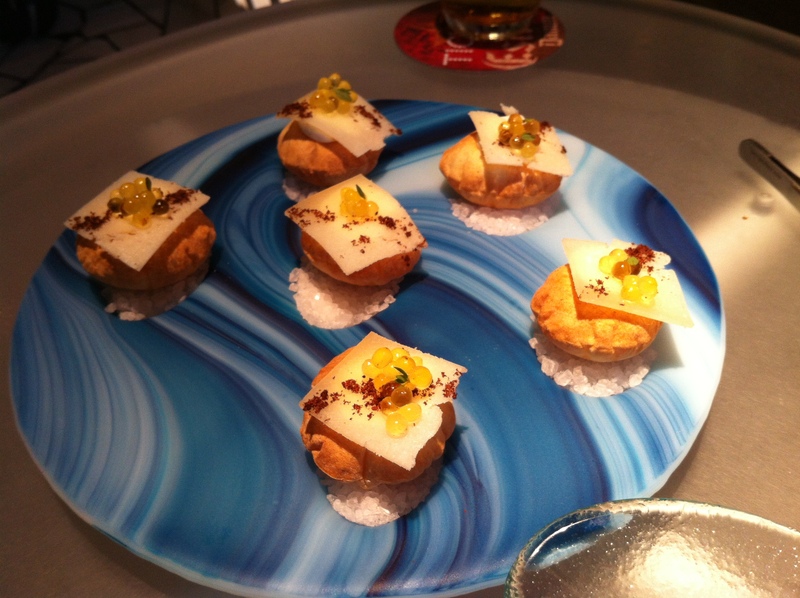 And the pearl on top were olive oil droplets! When I first saw them I thought it was golden roe (!). 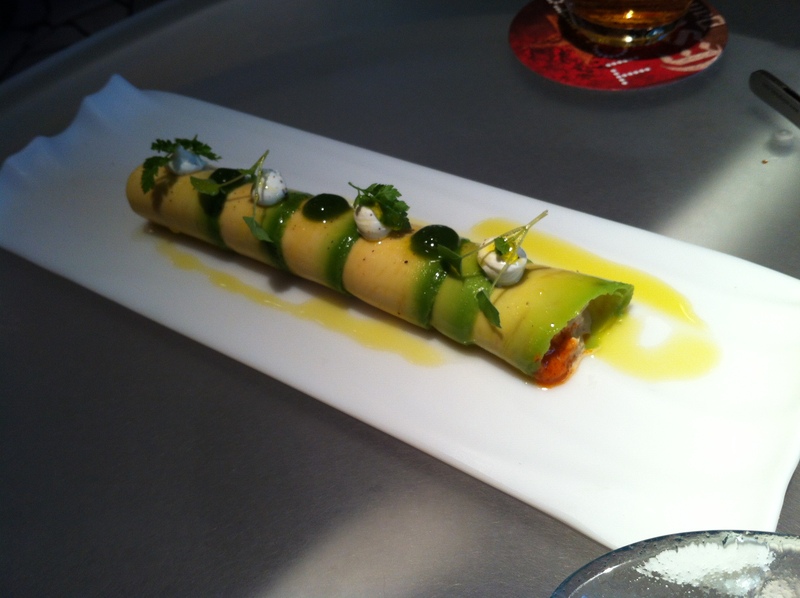 The chilled “avocado cannelloni with crab and romesco sauce” was a divine and delicately balanced dish. This was my least favourite dish for the evening. “Macerated prawns with soy and ginger” had prawns that were creamy in consistency (which is not my thing), but the sauce was delicious. 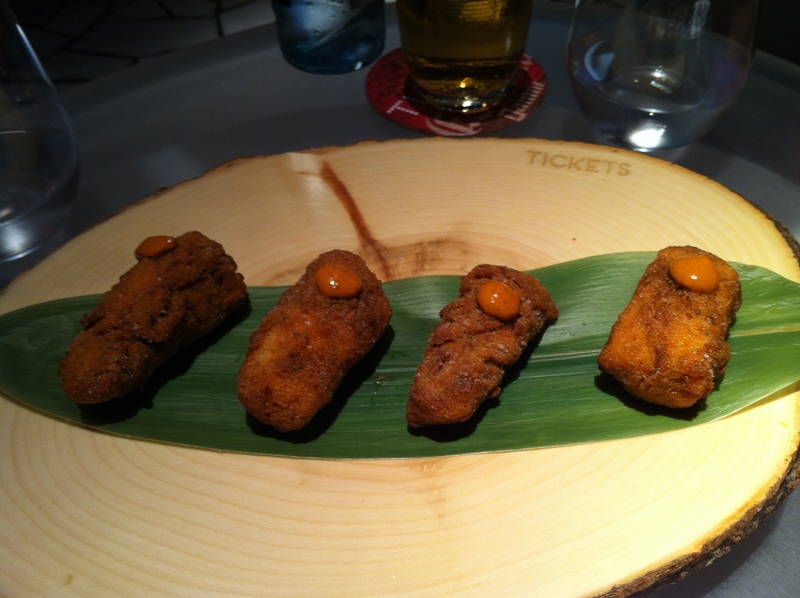 I have no idea how they made the “marinated fried fish” as the outer crust was so delicately crispy but the inside fish was perfectly moist and juicy. Delicious. The ““mollette” with double chin” was to die for. It was like the greatest pork sandwich I’d ever had. 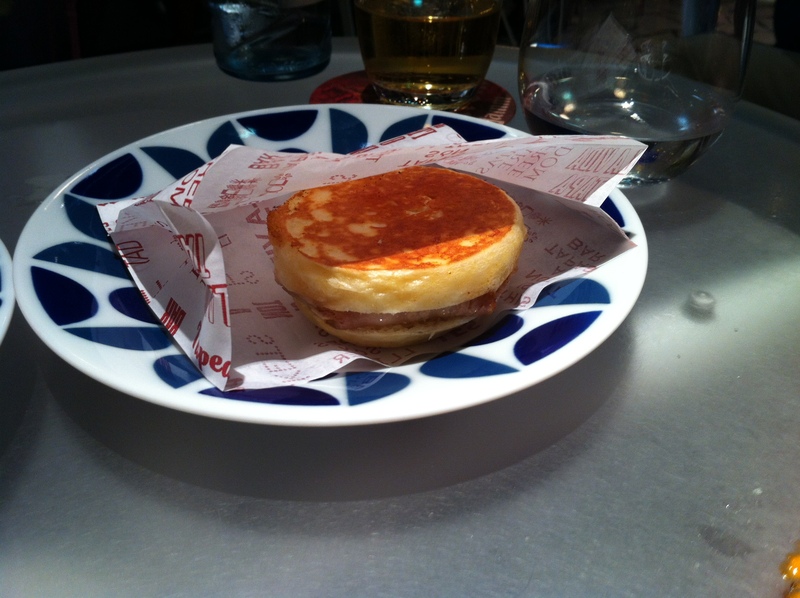 The consistency of the bread matched the juicy tasty pork to a tee. 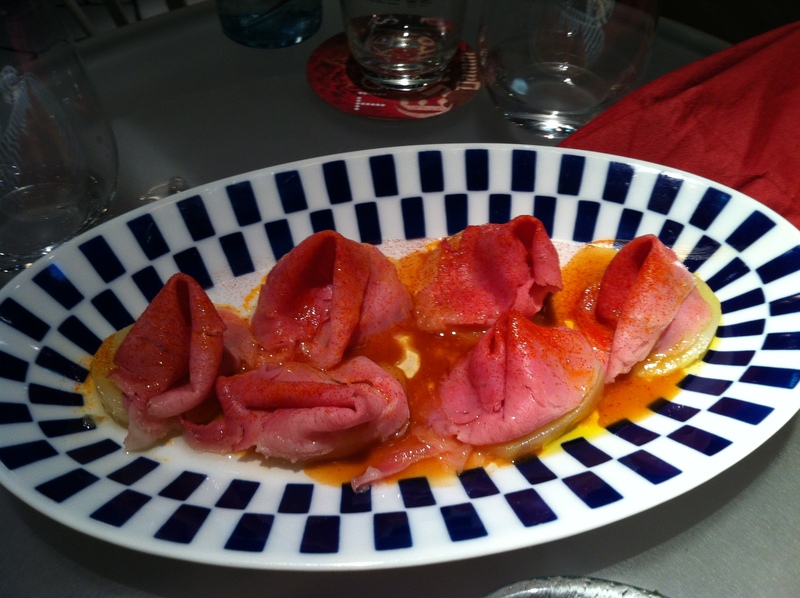 This dish looks a bit rude, but the “confit potatoes with pork rib jus and boiled iberian ham” was great! The potatoes had so much flavour in them! Loved it! 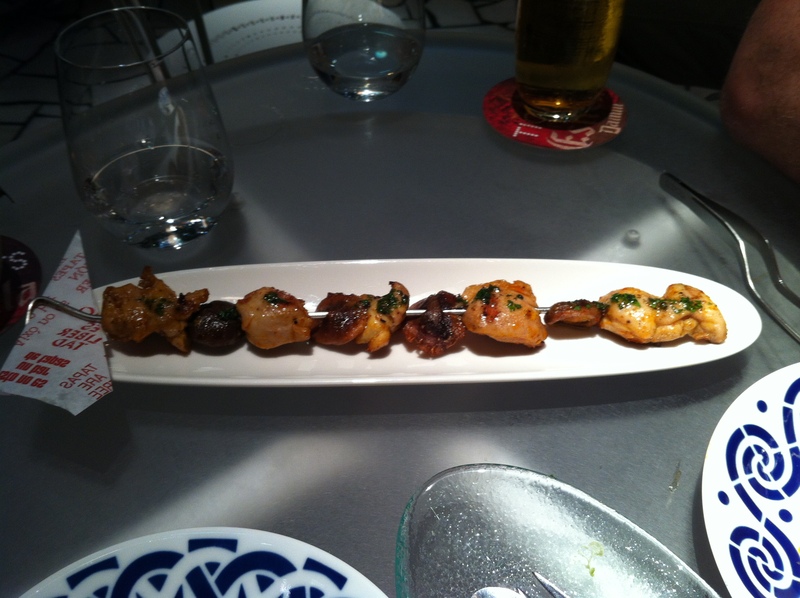 Tasty “chicken skewer with shitake mushrooms” was great – juicy chicken and mushrooms grilled on a skewer. 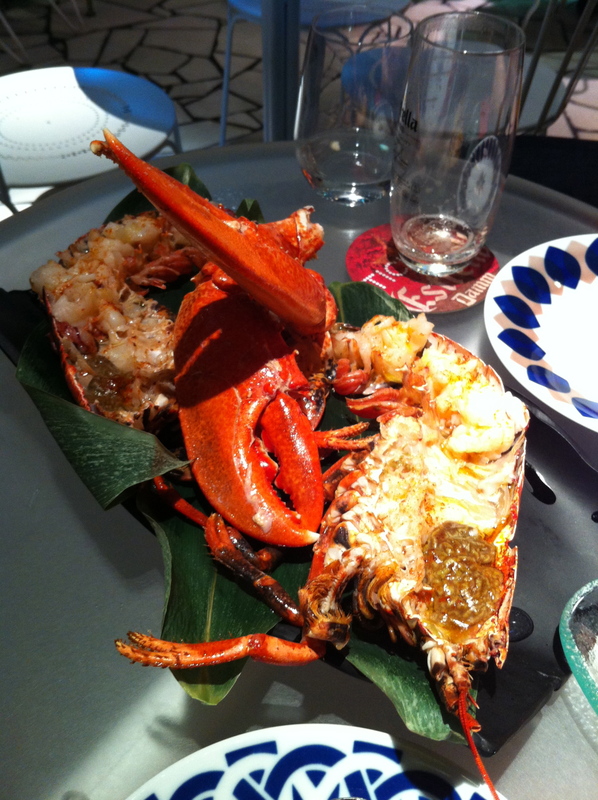 “Grilled lobster” was cooked perfectly and super tasty. Came with a lemony dressing which enhanced the sweet chunks of lobster meat. The “liquid ravioli of Payoyo cheese” was amazing! It was like cheese in a cheese membrane which just exploded in your mouth. The cheese was quite strong, like a mild blue flavour. The toasted bread atop gave a nice crunch. 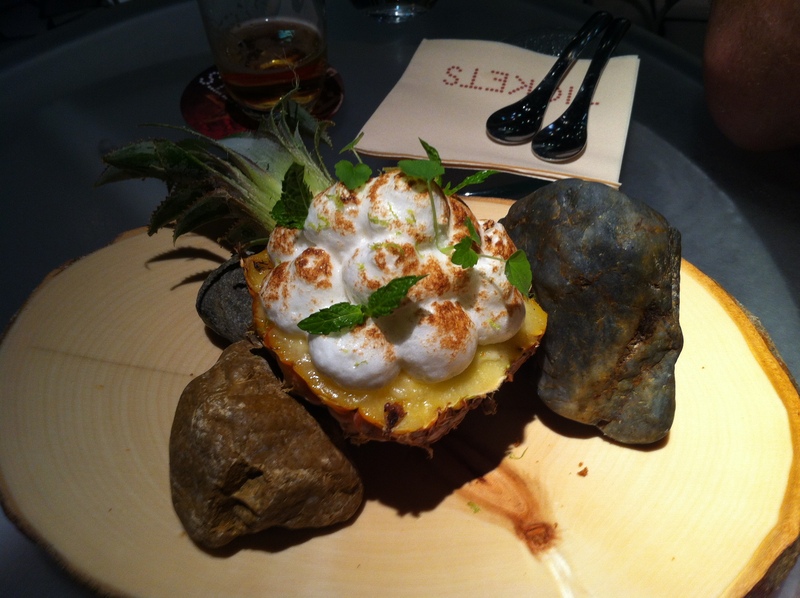 First dessert was the “pineapple with Maraschino cake and lime meringue“. Cold sweet chunky pieces of pineapple mixed with cake and covered with a browned meringue. Refreshing and light. My boyfriends step dad is Catalan so we had to have the “Catalan creme roll“. 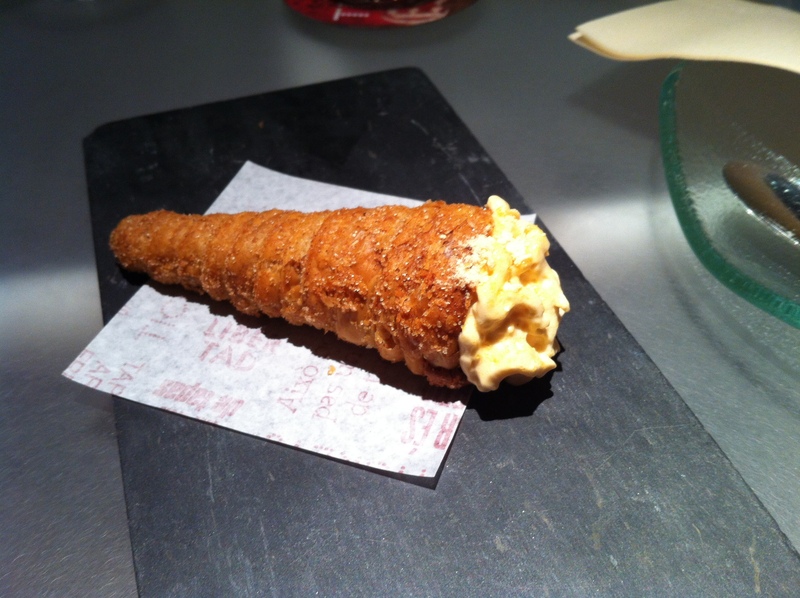 Sweet creamy filling with sweet crispy outer shell. 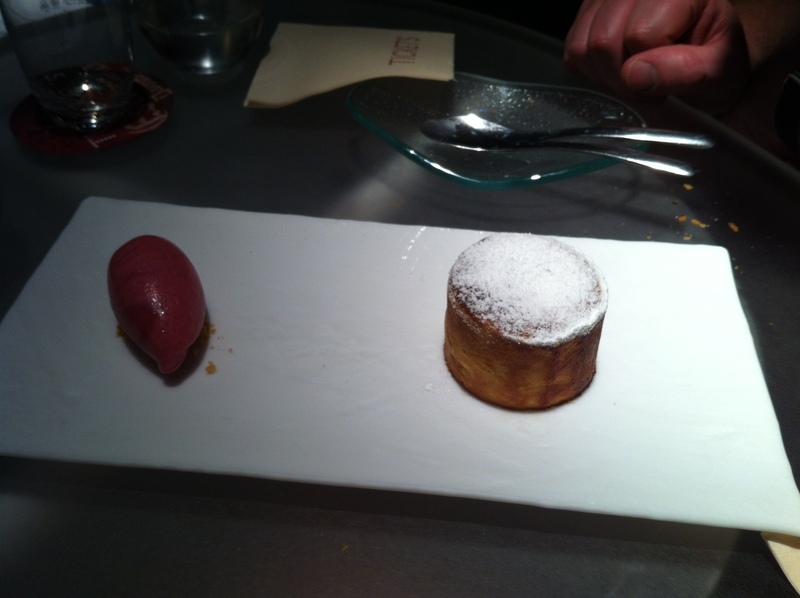 Last was the recommended “warm lava cake of “Turron de Jijona” with raspberry sorbet“. As described, the cake was warm and once broken oozing with almost caramel like sauce. The sorbet was a nice sharp contrast to the cake. So we had a lot of food. And it was delicious and quite the experience. I was really bummed that we didn’t get the forest dessert (it was like a chocolate cake and other things made to look like a mini forest) and the mango sorbet which is served to you from an old school ice cream cart. Guess I’ll have to go back for it! Just in case it wasn’t obvious – I love this restaurant.